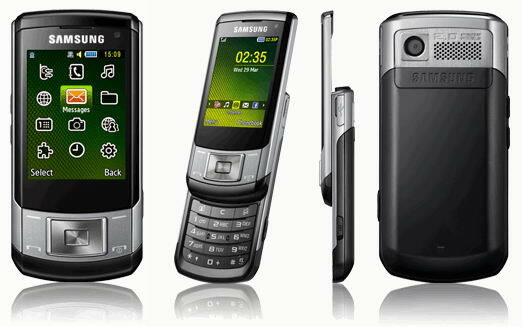 Tag Archive | "WAP Browser"
Samsung C5510 is a 3G enabled handset created by a manufacturer which is already a brand in the industry. The compact design of the handset has got a smart metallic look. It is very lightweight with slim and attractive features. The handset weighs nearly 99.6 grams. When you pick the device you will feel really good to hold it in your palm. The display of the mobile is 2.2 inches wide. The slide opening phone has got both a still camera and video recording facilities. You can take your best shots with this highly advanced 2 mega pixel camera phone. The mobile also has Photo editing application. It helps the user to edit the photographs according to their requirements. You can store the photos in your image gallery as the 20 MB internal memory gives enough space for storing all types of audio-video, image, and document files. When your internal memory is full you can either upgrade it up to 16 GB or transfer the data to your computer via USB port or Bluetooth device. The high end handset can store up to 1000 entries in its phonebook. If you run a business then it is obvious that you have to interact with several people every day. If you own this mobile then you can communicate with them through this single source of your contact database. Many people love to listen to music in their spare time, but it is not possible to carry a separate MP3 player or FM radio all the time. Samsung C5510 is certainly the best solution to this problem. It has FM radio with MP3 player. Now you can enjoy music more than ever with this handset. Playing mobile games have become a very popular trend especially among the teens. So Samsung C5510 has incorporated few JAVA games, but if you need a large collection of games then you can also download them into this handset to have more fun. The mobile set gives you the opportunity to access wireless internet from anywhere. With fast internet connectivity you can send email from this device. Other than sending emails you can also send MMS or SMS also. The T9 texting helps a lot to type the message faster easier way. You can also access and view Word, Excel, PowerPoint, PDF files through Document viewer software. Many users take full advantage of Voice memo application to record any conversation over the phone.